"..by my honor and my dignity before the great Turkish people to protect the integrity and independence of the State, the indivisible unity of people and homeland, and the unquestionable and unconditional sovereignty of the people. I swear loyalty to the Constitution. I take this oath for the brotherhood between the Turkish people and the Kurdish people." 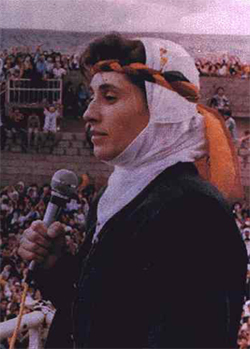 She pronounced the last sentence in the Kurdish language which was considered treason at that time by Turkish law. This law, repealed in 2002, dated back to the 30's when it was passed in an attempt to undermine the cultural cohesion of the Kurdish people. Following her oath the parliament erupted with cries of denouncement labeling Zana as a "terrorist" "separatist" and "dirty Kurd". However Zana's status as a MP initially gave her diplomatic immunity. I no longer believe in the Turkish parliament. Its role is to cover up the action of the State, to conceal the misdeeds of the army and the police. The people who make the decisions in Turkey are the members of the national security council. Members of parliament are like notaries, they merely register the decisions. In fact, it is against everything I believe in, I do not have a voice. No, I will not run again. Later in 1994 Turkish parliament banned her political party DEP and she was stripped of her former immunity. Leyla was then charged with subversion and membership in the militant Kurdish Worker's Party (PKK). Zana denied the accusations but the Ankara State Security Court found her guilty and she was sentenced to fourteen years. During Turkey's EU application review process, EU diplomats negotiated for Zana's release. Eventually, the Turkish courts saw fit to overturn the conviction on a technicality and in June 2004 Zana and four other Democratic Party MP's were released.